South Cornwall sees slightly less of a tourist draw than the north coast, resulting in quieter towns and villages, though there is no shortage of picturesque beaches. For those seeking a more laid back holiday full of long coastal walks with the dog, then the south coast may be just what you’re looking for. Take a look at some of the stunning dog-friendly beaches south Cornwall has to offer. The main beach at Talland Bay is a wonderful place to spend a day. Take the coastal path from either Looe or Polperro if you fancy a good long walk with your dog, enjoying the breathtaking scenery, or park up and take a short stroll through the village to the beach. 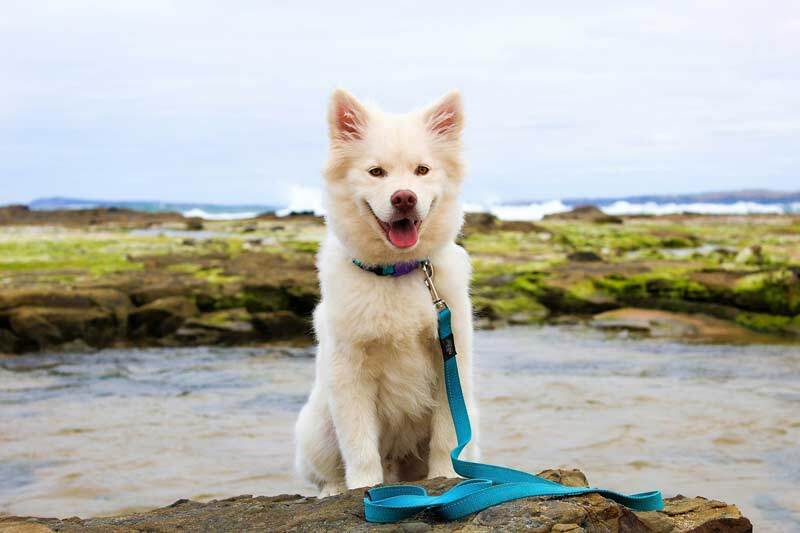 Walking on the beach is a little restricted at high tide, but as the tide goes out plenty of rock pools are revealed along with a natural pool your dog will love paddling in. As the main beach at Looe bans dogs all year round, and Polperro Beach enforces a seasonal ban through the summer months, this little beach is great alternative for those staying in the area with dogs, and there is a beach café and shop for refreshments too. Also close to Looe are the villages of Seaton and Downderry, which are effectively joined by the beach at low tide. Even at high tide you can walk between these popular sand and shingle beaches via the coastal path along the seawall. A meandering stream runs down Seaton Beach to the sea providing the perfect paddling spot for dogs and children. Seaton can get busy during the summer, but the walk along the beach between Seaton and Downderry is quieter, allowing your dog to have a good run off the lead. Both Seaton and Downderry have dog-friendly cafés and bars, including Seaton Café, Waves Bar, Inn on the Shore and Blue Plate. Parking is payable during the summer months, but Downderry does have a year-round free carpark just behind Inn on the Shore. Seaton has flat access onto the beach, however, there are some steps at Downderry. Just a few miles from Falmouth is the attractive, sheltered beach of Maenporth. This east-facing sandy beach is set between small headlands and has shallow waters, great for dogs and children. Note, there is a seasonal dog ban at Maenporth where dogs are not allowed on the beach between Easter Sunday and 1st October. With views over Falmouth Bay towards Pendennis Castle, it’s not just the dogs that will love it here. There’s also a pick of places for a beachside snack; the laid-back beach café and a more sophisticated restaurant, The Cove. The small village of Polkerris is home to a sheltered harbour beach overlooking St Austell Bay. Dogs can enjoy paddling from the stone quay, barking at wetsuit clad water sport lovers trying their luck with a sailing or windsurfing, and drooling at the smell of the delicious food being served from the beachside restaurant, Sam’s on the Beach. This small but beautiful beach operates a seasonal dog ban but dogs are welcome between October and Easter. All the facilities you would need are available including carpark, toilets, shop and pub. Whitsand Bay is made up of multiple beaches that all connect up to create three miles of dog heaven at low tide, this huge beach really is a hidden gem. Being so vast this beach is never crowded, leaving plenty of room on Whitsand Bay for ball throwing, wave jumping and of course, running at full speed along the shore. Make sure you look ahead at the tide times as many of the coves become cut off at high tide. This beach is better suited to the fitter dog (and owner) as all access routes involved steep paths and steps. However, the extra effort needed to reach this beach is rewarded with an endless stretch of unbroken sand backed by dramatic rocky cliffs which truly makes this beach spectacular. Facilities are limited here so remember to pack a water bowl. We recommend parking near Tregantle Fort for the least steep route down to the beach. For self-catering cottages in south Cornwall, click here.